The Alabama town was first called Troy on Oct. 9, 1838, in a deed recorded by Luke R. Simmons, a Pike County state representative in the Alabama Legislature. 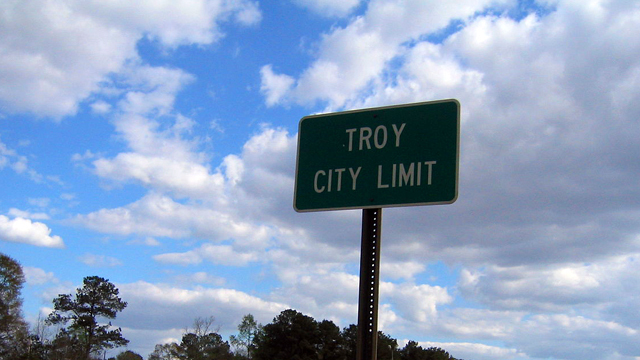 According to some reports, Simmons, a native of North Carolina, named the town in honor of Alexander Troy, a former attorney general of North Carolina. Col. Daniel S. Troy, the son-in-law of Alabama’s governor at the time, was Alexander Troy’s son. Others say the name was suggested by a man from Troy, New York, because it is easier to pronounce and spell than the town’s previous names, which were Zebulon and Centreville. The land on which Troy stands was once part of Creek Indian territory and was known as Deer Stand Hill. The first settlers came to the area in the early 1830s. In 1838, John Hanchey and John Coskrey, the owners of Deer Stand Hill, were responsible for moving the county seat to their property, and Troy was founded.